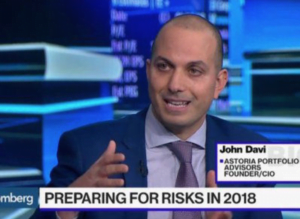 Here is a link to a TV interview that I did with Bloomberg on Astoria’s 2018 ETF outlook. First, I have to say that as a new firm that is in the business of managing investor’s portfolios, it very easy for us to paint a rosy picture how great the investing world is. There are parts of the market that offer value (and we own them) but Astoria believes that the 3 variants that made risk assets soar in 2017 (muted inflation, great earnings, and tremendous liquidity) will decline, on the margin, in 2018. The repercussions can be quite significant, especially on the margin, which is ultimately what drives risk assets. We are constructive on assets where there is a margin of safety. We simply think investors should hedge their risk assets to produce attractive risk adjusted returns over varying economic cycles. The key is to find hedges that carry well in an ETF portfolio. Here is to a happy and healthy 2018! I began 2017 with a very constructive outlook on cyclical assets mainly due to 1) low inflation 2) great earnings and 3) tremendous liquidity was being supplied by central banks. So, we still own these cyclical assets largely because they still offer a margin of safety. However, we simply think 2018 you will need to hedge these risky assets if your goal is to produce attractive, risk adjusted returns. o QAI: It’s rules based, systematic, and quant driven so this checks a lot of boxes for us. The bottom line is this: In the 10 worst months for SPX since 09, the underlying index for QAI was down 15% vs -54% for SPX (downside capture ratio was 28%). o We are starting 2018 with a small amount of hedges but will be scaling up as our models and indicators turn. o Our hedges carried very well in our portfolios in ’17 (QAI, IAU, and TLT were up between 6-12% in 2017). However, this also speaks to how unusual of a year 2017 was! o I mentioned on the show that inflation, in our view, is rising. Commodities are 1) uncorrelated 2) under-owned, and 3) historically have done well when inflation rises. In a world where most assets are expensive or at fair value, commodities are cheap. o COMB takes on the “Vanguard approach”: The ETF utilizes an index replication approach, is the cheapest commodity vehicle out there (30bps), and there is no K-1. I prefer the Bloomberg Commodity index over the GSCI because energy/oil capped at 30% in BBG vs. 60% in GSCI. o COMB is a new ETF and liquidity is only starting to build, so investors will need to work with an ETF market maker to facilitate trading. o Engraved in my DNA is this concept of investing with margin of safety. By definition that equates to value stocks. Currently, we are big fans of International value stocks. o US stocks, for the most part, are crowded, expensive, and vulnerable. US growth stocks represent a huge funding risk in our view. o Historically international value has worked better outside the US and has been more persistent. o I like mixing international value and momentum together in a portfolio – they have very interesting portfolio attributes (negative correlation). o We like IVAL which are cheap international stocks that have a quality basis. There is a heavy exposure to Japan, which for those that aren’t familiar with Astoria, we have been big fans for quite some time. o For international momentum, we like IMOM. o This year, as a tactical trade, we took on the International Size Factor via VSS. Think about it. What asset class is going to benefit when you have tremendous liquidity and an overall great earnings environment? Small Caps! o International Small Caps have lower beta, lower volatility, varying factor and sector exposures compared to their large cap counterparts. This is the opposite of what we see in the US between the Russell 2000 index and the S&P 500.
o You want to avoid most parts of the Fixed Income marketplace if you are a value centric investor. The Bloomberg US Aggregate Bond index is no long risk reduction (duration has gone from 3.5 in 2009 to over 6 now) nor is it high income (yield is only 2.5%). o Astoria is utilizing PFF, HYD, SRLN, and EMB which each offer at least 2x the yield of the benchmark. None of these are given the opportunity it did years ago but there is a modest margin of safety compared to most traditional fixed income segments. o HY Credit is rich, crowded, expensive and fed tightening cycles have historically coincided with spreads widening. If liquidity declines next year, High Yield Credit could be negatively impacted given how sensitive the asset class is to the liquidity cycle. Other things I briefly mentioned or didn’t get the opportunity to do so but it fits given our comments above. o Astoria is not a closet indexer. We take active share (i.e. Large concentrated positions in ETFs given our quantitative investing framework and then utilize risk models to help us desensitize our portfolio volatility). o We are going to have tracking error vs. our benchmark but we will always focus on risk adjusted returns throughout varying economic cycles. o If you don’t want tracking error, there are plenty of Robo Advisors out there and one of them now just went free. However, I can’t emphasize enough how dangerous data mining and extrapolating can be particularly when these Robo Advisors were constructed in an era of QE where volatility has been sucked out of the system. o We are quants at Astoria and love data and systematic, rules based investing. We do that as well! However, there is a human oversight to our process. o How many of these Robo Advisors are going to be picking up a decline in liquidity, a tougher YoY comp for earnings, or inflation rising – the 3 pillars that sent risk assets to the moon in 2017? I doubt any will – nor should they. o Most robo advisors will given you a traditional asset allocation framework and tell you that you need to have a certain allocation to fixed income on a global basis. Well, why on earth, would you want to have an allocation to negative yielding Japanese and European sovereign debt. It doesn’t take a genius to realize that’s a pretty poor risk reward. o Let’s not kid ourselves. Robo Advisors are correcting the following bias in the investing world 1) high fees 2) human behavioral issues when it comes to investing and 3) poor track record by stock picking managers. o We solve for these 3 attributes by doing quantitative, systematic investing, at discounted pricing, and focusing on multi asset investing. Plus, our ETF product expertise and our inhouse research is a big edge for Astoria versus our competition.